Xmas and New Year's Eve are traditionally a time to get sentimental. We started getting sentimental about last year's poetic holiday masterpiece by Tom Ernste and Hannah Trostle and decided to share it again this year. 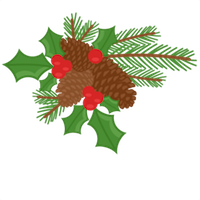 From all of us at the Community Broadband Networks Initiative at the Institute for Local Self-Reliance, we wish you a happy holiday season and a 2017 filled with great moments! It's Christmas Eve and We're STILL Thinking of Muni Fiber! Public sector agencies are the nation’s largest telecom customers. A community with a population of 40,000 purchases an estimated $1.1 million dollars annually in telecom services – costs offset by use of I-Nets. Imagine the devastation on local budgets when state video franchising laws eliminate I-Nets as compensation for use of public right-of-way. It’s rumored that a cable operator can charge a California community $45,000 a month to use a thirty-drop I-Net that, prior to passage of the state video franchising law, had been part of payments for use of public rights-of-way.